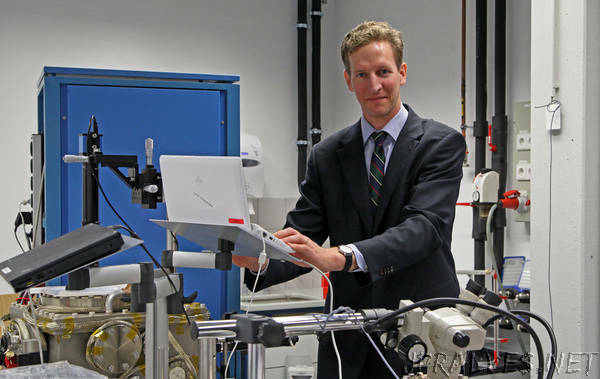 Physicists at Friedrich-Alexander-Universität Erlangen-Nürnberg (FAU) have successfully generated controlled electron pulses in the attosecond range. They used optical travelling waves that are formed by laser pulses of varying wavelengths. The movements of electrons in atoms were revealed using attosecond free-electron pulses. The findings of the researchers from Erlangen have been published in the acclaimed journal ‘Physical Review Letters’ (DOI: 10.1103/PhysRevLett.120.103203). Scientists have been researching ways of generating packets of electrons in extremely short timescales for several years. Such pulses enable ultrafast movements to be tracked, for example vibrations in atomic lattices, phase transitions in materials or molecular bonds in chemical reactions. ‘The shorter the pulse, the faster the movements that can be mapped,’ explains Prof. Dr. Peter Hommelhoff, Chair of Laser Physics at FAU. ‘However, this also involves the special challenge of how to control the packets of electrons.’ Last year, Hommelhoff and his team successfully generated periodic electron pulses with a duration of 1.3 femtoseconds – a femtosecond is one quadrillionth of a second. To do so, they directed a continuous beam of electrons over a silicon lattice and superimposed it with the optical field of laser pulses.